Strictly Come Dancing: what’s Ainsley Harriott cooking up with his partner for tonight’s show? But it seems Ainsley spent some of his practise time showing Natalie his moves in the kitchen. 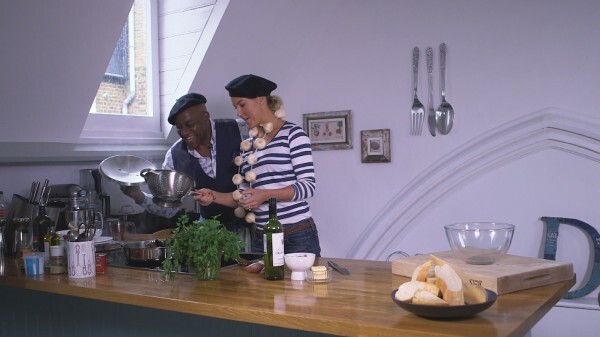 Ainsley put his chef skills to use by cooking Natalie a meal inspired by their first dance: a Tango set in a Parisian bar, with Abba’s Voulez-Vous as their music. Natalie tells Ainsley she’ll teach him to dance, if he cooks her a meal. The end result is a delicious Moules mariniere. But what will be the end result of their Tango? Click here for all the news on Friday night’s first live show, where Call the Midwife star Helen George came out top.